Though the exhibition is a little bit all over the map, there are some real gems to be found here. The phenomenon of commercial galleries mounting museum-like shows has been an interesting development in the New York art scene. We’ve seen this with the Alice Neel show at David Zwirner, Picasso and the Camera at Gagosian, and Laughter in the Dark at Hauser and Wirth. Michael Rosenfeld now enters the same territory with a massive exhibition, weighing in at 58 works of art. 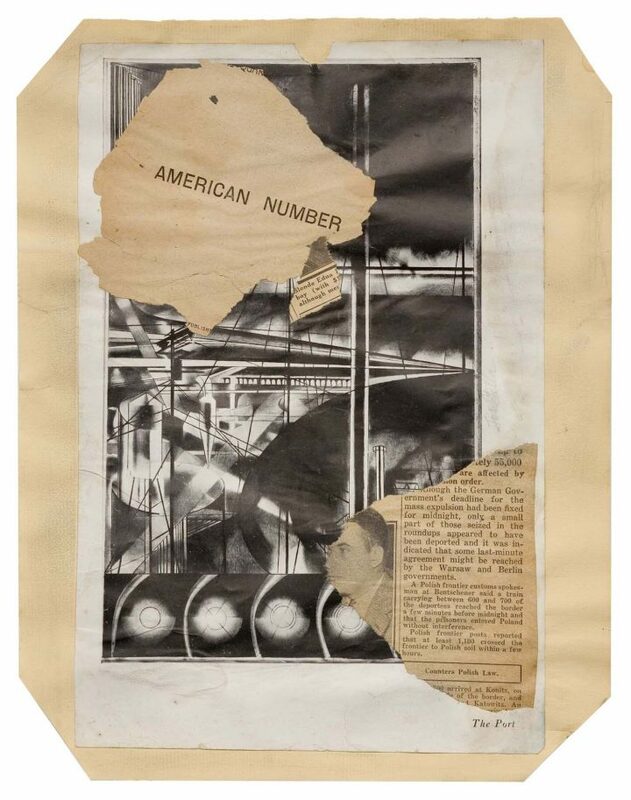 The show, entitled Collage: Made in America, does not try to be an exhaustive or even chronological survey of the genre. Since there is no press release or curatorial statement, the title of the exhibition serves as the only its description and indication of the show’s organizational umbrella. What Collage may lack in organizational clarity it makes up for with the breadth of works shown. 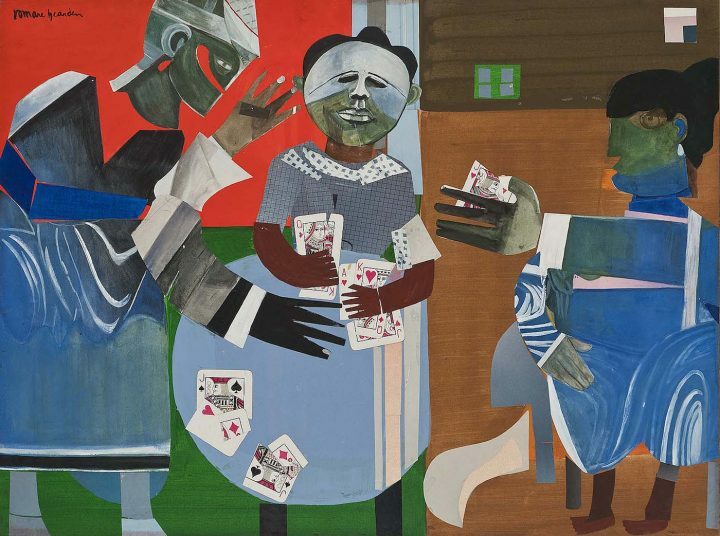 Many of the artists are well known in the genre: There are six stunning Romare Bearden collages as well as pieces by Jess, Lenore Tawney, and Conrad Marca-Relli — to name only a few of the bigger names. Additionally, there are works by artists I had never heard of, such as Charmion von Wiegand and Gertrude Greene. The show is an odd mix of many works by some artists (Bearden and Hannelore Baron, for example) and then lone pieces by the likes of Robert Arneson and Yayoi Kusama. Sometimes this works, other times not so well. The Arneson (“Hello Halibut,” 1974), for example, looks a bit thin and anemic, especially in contrast to some of the richer pieces hung nearby. The piece that greets you as you walk in the gallery is an absolute knockout by Richard Pousette-Dart from 1945–52, “Untitled (Plato).” The densely layered collage, pulsating with energy, color, and image, is a masterful work, highly organized and seamlessly encompassing many different kinds of media. The rhythmic long verticals of the tall, skinny composition are punctuated by magazine images, alphabet letters, and photographs. It’s organized in an elegant and exciting way, leading the eye to read the piece in several directions at once. It does not convey a linear narrative, though there are bits and hints of a story buried within the cacophony of color and image. There is an extraordinary amount of information packed into this piece. Similarly, it’s a treat to see a piece by the somewhat underrated Abstract Expressionist painter Michael Goldberg. “Still Life with Onion Rolls” (1956) is a glorious example of Goldberg at the height of his career. Big gestural brushstrokes alternate with finer ones to create a dynamic canvas bristling with movement and energy. 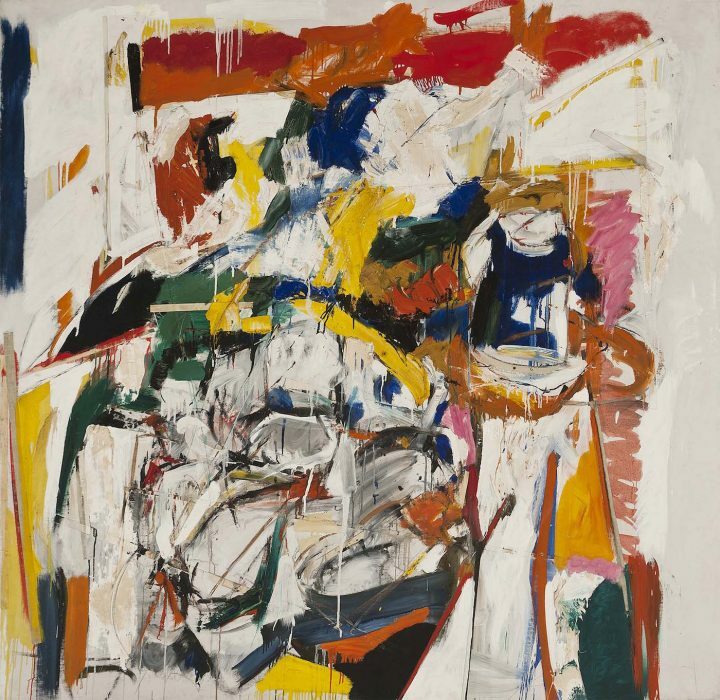 The gallery checklist states that there is “tape” buried in the painting; that is the collage element, though where exactly it ceases to matter given the chance to relish the delights of a Goldberg painting. Five Joseph Stella pieces are of historic interest. The small collaged and painted works on paper feel delicate, their compositions almost casual. They convey the sense that they are made from the found detritus of a big city. It’s an interesting counterpoint for an artist who is most widely known for his more bombastic painted works. In the rear of the gallery, one entire wall is filled by the monumental “Circle (The Bicentennial Series)” (1973) by Benny Andrews, a huge, searing indictment of racism in America. Twelve canvases hung together depict the crucifixion of a man on an old-fashioned iron bed. A surrealist mechanical “creature” has pulled his heart out — but his heart is a watermelon. Made of collaged and painted elements, he is several colors, a metaphoric depiction of all who are oppressed in America. The bed, off-centered in the gigantic installation, is surrounded by people in various states of reaction to the ghastly act they are witnessing. Some are passive, some agitated. It’s an overtly angry and political work of art, one that has continuing resonance today. This show has a little bit for every taste, from abstract to figurative collage, which is both its strength and its weakness. Though a little all over the map, there are some real gems to be found here. It’s worth the hike over to the West Side Highway to see what catches your fancy. Collage: Made in America continues at Michael Rosenfeld Gallery (100 Eleventh Avenue, Chelsea, Manhattan) through March 31.